Simply put, 2018 had to end this way. A year that saw Matthew Kolodzik roll through four of the top six seeds at NCAAs and Princeton end long droughts to both Lehigh and Rider fittingly ended Sunday night with the Tiger wrestling program end a 55-year drought by claiming its first Midlands individual champion. And then it ended a 55-minute drought by claiming its second. Top-seeded Matthew Kolodzik, the nation’s top-ranked wrestler at 149, defeated Northern Iowa’s Max Thomsen 3-1 to claim Princeton’s first Midlands title, and sophomore Patrick Brucki, currently ranked third at 197, ended the dream run of South Dakota State’s Tanner Sloan with a 13-4 major decision to earn the program’s second title. Those wins, along with a strong overall performance throughout the team, helped Princeton to its highest-finish ever at Midlands. The Tigers placed fifth overall with 92.5 points, only five behind Wisconsin. Kolodzik broke the program drought with an impressive defensive showing and a timely first-period takedown of the third-seeded Thomsen. After a feeling-out process through much of the opening period, Kolodzik got in on Thomsen’s legs and secured the takedown with less than 10 seconds left in the period, which kept the third seed from scoring an escape point. Kolodzik escaped quickly in the second to grab a 3-0 lead, and Thomsen added an escape of his own early in the third to draw within two points. The Northern Iowa product tried for a tying takedown, but the two-time All-American put on a brilliant defensive display and fended off one final late shot to complete the 3-1 win. 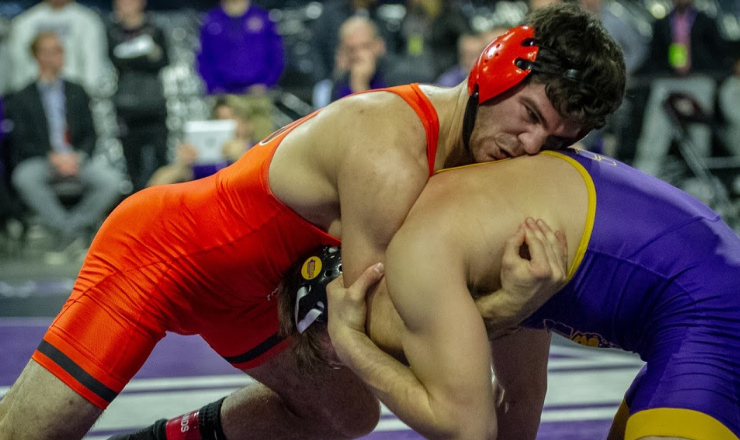 The often-stoic Kolodzik, who avenged a 2017 Midlands loss with a 7-4 semifinal win over Iowa’s Pat Lugo, clapped loudly when he was announced as Princeton’s first Midlands champion and pointed excitedly to a loud, orange-clad cheering section. While Kolodzik’s match was dramatic until the final whistle, Brucki seized control immediately against Sloan, who knocked off both the second and third seed to reach the final. The Princeton sophomore captain had his first takedown within the first 10 seconds and didn’t stop until he had four in the opening period alone. A variety of shots all landed points for Brucki, who scored a team-best 27 points throughout the weekend — which would have finished only one point behind Penn for a Top-20 finish. While his championship performance was impressive, it wasn’t his only one Sunday. His semifinal was a potential EIWA title preview against sixth-ranked Rocco Caywood of Army, and Brucki was just as overwhelming in a 9-1 major decision. Patrick Glory had a brilliant weekend of his own, even if he didn’t end up on the top of the podium. Glory dropped a semifinal decision to top-ranked Spencer Lee of Iowa, who had teched the Tiger freshman in an earlier dual meet. Lee looked on his way to another tech after a pair of near falls in the first period, but Glory would not go quietly. He scored a reversal and ended up putting Lee to his back in an eventual 12-6 loss. Though disappointed not to reach the final, Glory seemed inspired by the way he finished, and he showed it with a pair of major decisions to place third, including a 14-5 win in the finale over Wisconsin’s Connor Brown, the nation’s 19th-ranked wrestler. Both Quincy Monday and Kevin Parker dropped their opening matches Sunday and just missed the medal podium after impressive runs to the quarterfinal round. Princeton will return to the mat on Saturday when it competes at the F&M Open, and then the Tigers will return home to prepare for a huge home weekend against both North Carolina (Friday, 7 pm, Dillon Gym) and Oklahoma State (Saturday, 1 pm, Jadwin Gym). What the hell, Nia Jax?